ASA reprints the most current FAA Practical Test Standards (PTS) in this series of handy cockpit-sized guides. Every PTS is written by the FAA and details the type and levels of skill and knowledge that must be demonstrated before an examiner can issue a certificate or rating to an applicant, describing also the background study and reference materials. 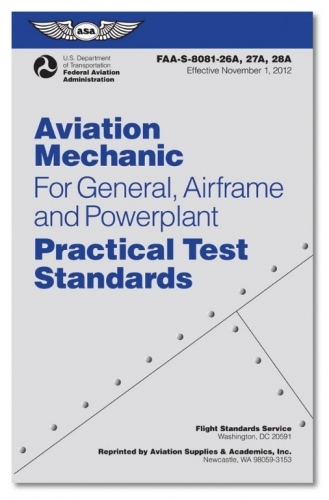 This new PTS guide for mechanics includes all three current standards in one book for the General (8081-26A), Airframe (8081-27A), and Powerplant (8081-28A) sections of the Oral & Practical exams, the last step in the quest for the Aviation Maintenance Technician (AMT) certificate. The standards presented in these guides are the only way for AMT students, their instructors, as well as the examiners themselves to know what the FAA expects for these required tests. Therefore they are essential tools to use in preparation and study for passing the tests to become FAA-certified aviation mechanics.